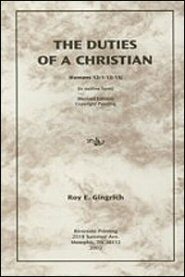 In this study, Mr. Gingrich focuses on 12:1-15:13 of the book of Romans, dealing with “the living out” of the transformation which took place in the believer’s heart when he believed. The outline begins with a helpful and interesting introduction to the believer’s responsibilities in regard to his various duties. Then in a verse by verse exegesis, he clearly outlines the believer’s religious duties. His treatment of these duties is so clear that even the most difficult passages are easily understood. Without hesitation, this outline study is recommended to any Christian who desires a better understanding of the duties of a Christian. It will be especially useful to pastors of churches and to teachers of home Bible classes.